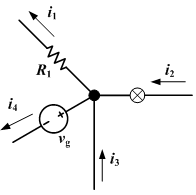 Paul, Clayton R. Fundamentals of Electric Circuit Analysis. John Wiley & Sons. 2001. ISBN 978-0-471-37195-3. This page is based on the Wikipedia article 基爾霍夫電路定律; it is used under the Creative Commons Attribution-ShareAlike 3.0 Unported License (CC-BY-SA). You may redistribute it, verbatim or modified, providing that you comply with the terms of the CC-BY-SA.